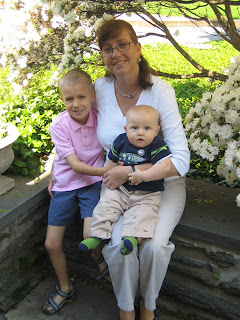 Hillary Chybinski: mother's day. . .
. . .the boys showered me with cards, gifts, kisses and hugs. they probably have no idea how much being their mom means to me. even when i complain about it. it's one thing i wouldn't trade for anything in the world - my family. it really is a gift - even if you'd like to return it somedays - it's a gift, a miracle. the smiles, the skinned knees, the stories of adventure. . .when i let myself sit back and enjoy it - it's a wonder. if I could only find a way to keep myself from stressing over the small stuff - clutter, unwashed faces, messy cat dishes, dust bumies. . .in the grand scheme of life - they don't matter at all.